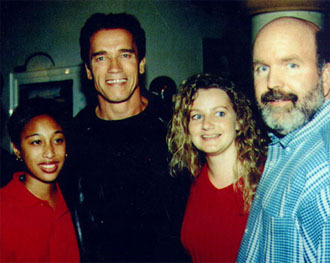 James P. Reber (on the right) with Staff Tricia Kerkhof and Talya Rogers at a special reception in Arnold Schwarzennegger's restaurant in Santa Monica. Prior to being Governor, Mr. Schwarzennegger was the National Chairman of Inner City games (later changed to After-School All-Stars). Mr. Reber was initially a pro bono consultant for the local chapter. He was eventually hired to be its Founding Executive Director, where he launched the organziation and managed it for its first five years. Now a Book! Buy it! James P. Reber has been primarily a management consultant since 1990, though he has also served as Executive Director a few times during this period of time. Being an effective consultant, especially in nonprofit management areas, means being able to understand what managing a nonprofit organization entails. Mr. Reber's practical style of consulting is something that many clients find refreshing and very useful. This style comes from the background of having been an Executive Director of a nonprofit start-up, a medium-sized organization, and one of the large, established community institutions. Few management consultants have this kind of broad-based, practical experience. Below is a list of the primary Fundraising Services offered by James P. Reber. Following the list is a more detailed description of each one of these. A FREE consultation is always provided for anyone interested in any services. James P. Reber, Nonprofit Fundraiser, Fundraising Consultant, Public Speaker, Event Planner, Event Producer, San Jose, Silicon Valley, California serves the South Bay Area, including nearby communities of Santa Clara, Cupertino, Milpitas, Los Gatos, Saratoga, Sunnyvale, Mountain View, Palo Alto, Los Altos, Morgan Hill, Campbell, Fremont, Redwood City, Santa Cruz, Scotts Valley, Menlo Park, Atherton, Portola Valley, and San Mateo. Mr. Reber serves Santa Clara County, San Mateo and Santa Cruz Counties, as well as the greater San Francisco Bay Area - Alameda, San Francisco, San Benito, Contra Costa, and Monterey Counties.